At the end of last year, we were proud to announce our new CHAETOPRIME product. ChaetoPrime is premium freeze dried Chaetoceros muelleri and is unique in this form. Proviron is the sole producer of freeze dried Chaetoceros and we have experienced a lot of interest from shrimp and shellfish hatcheries worldwide. We have been running in continuous production since the start and output results are very satisfactory. This means that we have surpassed the starting up phase and are able to provide consistent high quality product all year round. 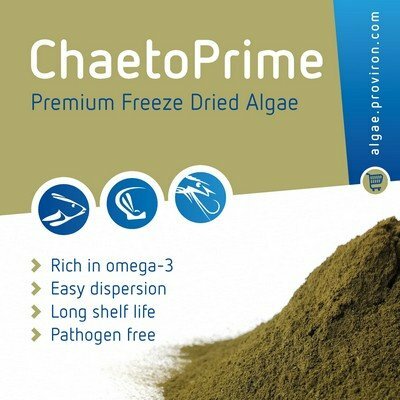 ChaetoPrime is the preferred algae to feed the early larval stages of penaeid shrimp and shellfish species. This diatom has a balanced nutritional profile containing all essential HUFA's such as EPA, DHA & ARA. Please check the new prices on https://algae.proviron.com/Chaetoprime.html and order your first trial quantities!